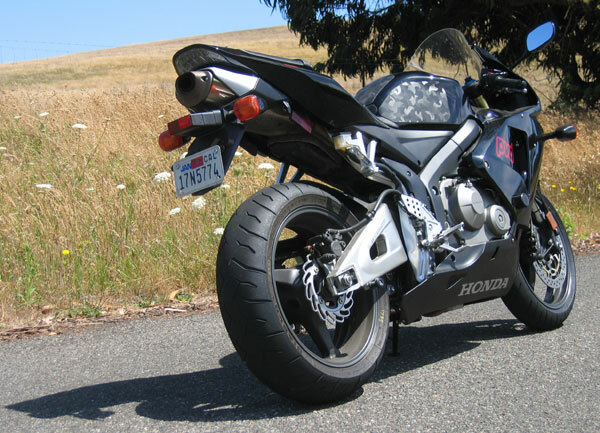 This page will document each step I take toward making my 2005 Honda CBR600RR into an even more amazing machine than it already is. Check back as time goes by, I will be adding to it constantly. This bike is very new and parts are only now becoming available. All of the changes I make to this bike are meant to make the bike run better, faster, stronger and in more control and comfort without wasting money. If it really makes the bike work better, I will do it. If it is just for show or is a misplaced hop up (ie. full race exhaust system on a street bike) then I will not do it. I hope to explain what I am doing and show pictures to elaborate. For a better understanding of why I am doing some of these things, see my main motorcycle page at www.peterverdonedesigns.com/motorcycle.htm. This page is not meant to replace the OE Honda Factory Service Manual. Always use the factory service manual (and even an HRC Kit Set-up Manual) to supplement your tuning adventure. 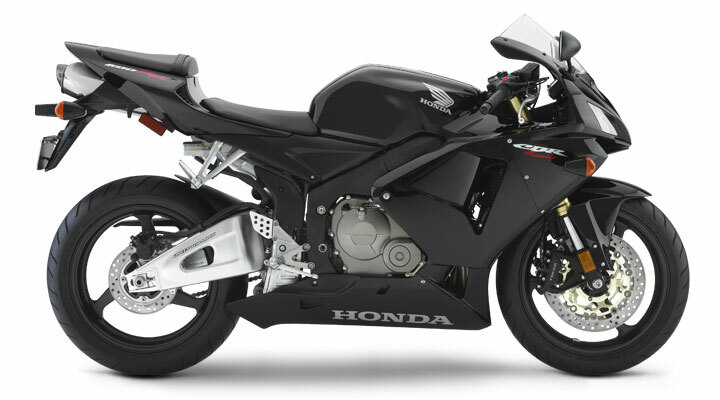 HRC has released the kit parts for the 2005 CBR600RR, see the HRC website for more information. Tapered Roller Bearing Head Bearings - Need a better way to support the bike. Woodcraft Frame Sliders, black - These are in and waiting to install. I had planned on getting my bike from nearby Marin Cycleworks. Everything went fine with the salesmen. Owen and Damon, were very helpful. Once the bikes arrived, I went down to talk about final out the door price. Lucky for me I had called Cycle West in Petaluma and had spoken to Guy. I knew that they would charge $9,050 OTD. MSRP is $8799, but I expect some premium for getting the first run of this bike. The sales manager at Marin Cycleworks said that the lowest that they could possibly go was $11,325 OTD and stood firm even after I told them about Cycle West's price. That is a difference of almost $2,300. I was really unimpressed by the way the sales manager handled all of this and his technique was very slimy. He lost the sale, not Damon or Owen. Obviously, I got my bike at Cycle West. Everything that they promised me happened like clockwork. The stock brakes on this bike are utterly amazing in stock form. I would otherwise not make this mod, but I have a set of Goodridge stainless braided lines left over from my CBR600F4i. The part numbers are identical, so I figure that I might as well make the swap. If I was going to buy new lines now, I would get the Goodridge Kevlar lines. They look pretty. One frustrating detail about the stock lines. The lower lines are very high quality. They appear to be kevlar, but I doubt it. They are probably stainless braided under the black plastic. If they had run this line all of the way to the master cylinder, I would never touch the stock lines. It really is a shame. Maybe future models will start getting this treatment. 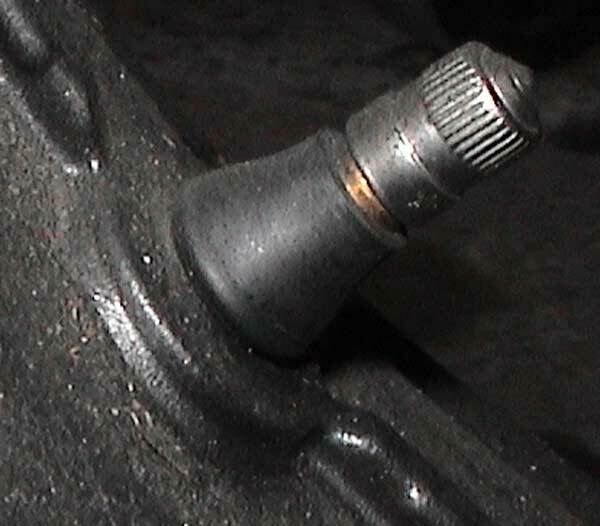 One thing that should be done when changing brake lines is to use a banjo bolt at the master cylinder that has a bleeder on it and speed bleeders at the slaves. These don't cost too much, but can help you at times when you need it most. Always use Goodridge or Aeroquip parts. 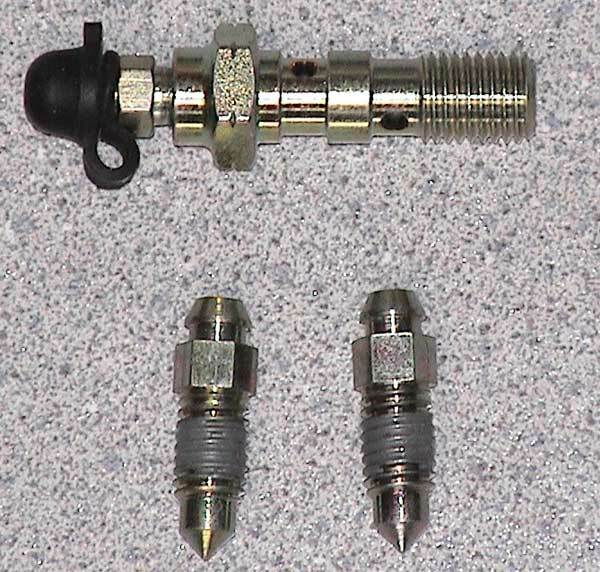 Of course, I ordered 8mm speed bleeders when the stock Honda bleeders are 7mm. So I couldn't get the speed bleeders in this time. C'est la vie. 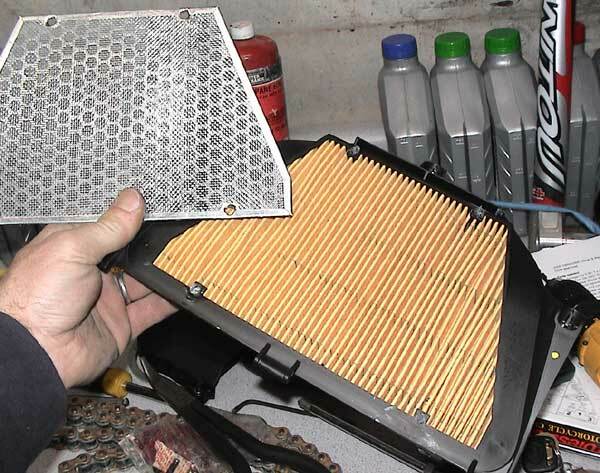 On the intake side, the single greatest restriction to flow is the air filter. Stock filters are about the best way to filter air and they have a good service life. 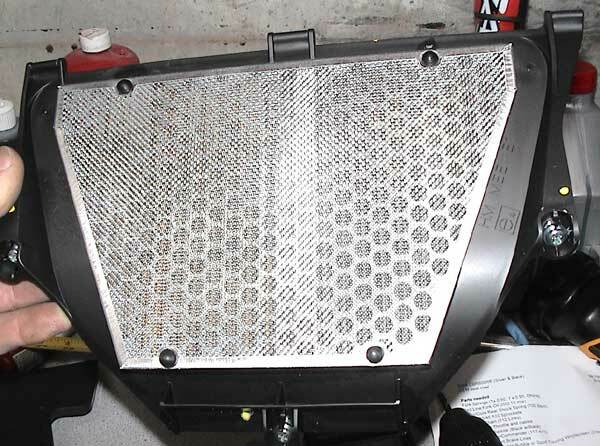 One easy modification to improve performance without loosing the ability to clean air is to remove the fire screen. This screen further restricts flow, and only serves to prevent a horrific fire under your gas tank and chest. Screw it, speed thrills. I tossed in 31 psi front and 31 psi rear. It probably doesn't matter too much right now as it is winter and I am riding on wet roads with a film of slime of over the top. If the road is dry, It probably has landslide dirt all over it. Dealers pump the tires up to 42 psi. Fools. Steel valve caps as per race rules. 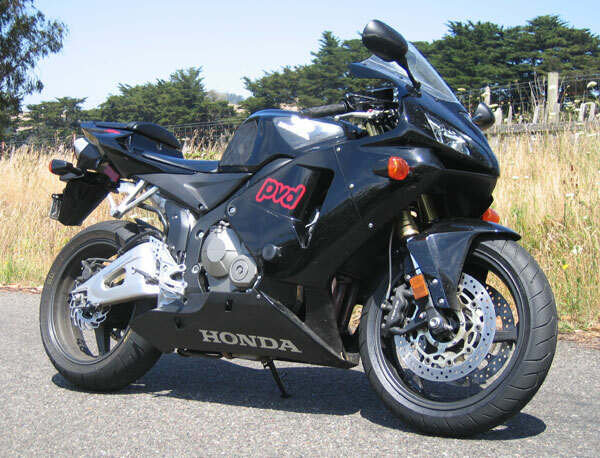 The owners manual for the 600RR recommends a gasoline with a pump octane number (PON) of 86 or higher. This is the number that most gas stations use to post their octane grades. To confuse the issue, the CBR600RR's data tag under the passenger seat recomends a fuel with a research octaine number (RON) of 91. PON is equal to (RON+MON)/2, so that means that the motor octane number (MON) for the fuel should be 81. By knowing that the MON can be anything above 81, special racing fuels can be ordered from VP Racing Fuels (which use MON) for trackdays without wasting money on an overly specialized fuel. Racing gas has the valuable property of having more energy contained in it, much more important than octane if you are not knocking. The currently favored fuel by top supersport and superstock racers is VP MR9. This fuel has a MON of 87. Go figure! VP U4 is a great option for more power gains while not being AMA Pro legal. I will only need to run a higher octane if my engine knocks. It has not knocked yet. People waste a lot of money buying premium gas. Don't waste money. Track use requires removal of standard Propylene Glycol or Ethylene Glycol based coolant mixes. You can replace the coolant mix with plain distilled water or a mix of distilled water and Red Line Watter Wetter. Standard coolant mixes are ususually 50/50 mixes of a glycol based fluid and water. They are designed so that they do not freeze at most common temperatures and inhibit rust and corrosion in the cooling system. While Water Wetter does have rust and corrosion inhibitors in it, the design intent of it is to help water (the most effective coolant) work even better. In theory, Water Wetter should help your bike actually run cooler than with any other coolant mix. Because of this, even if you do not go to the track, but you push your bike hard in hot weather, you may want to consider switching. Water Wetter does nothing at all to prevent freezing, so be carefull to address this as winter approches. Since freezing is not a concern in the part of California that I live in, Red Line suggests a mix of 1 part Water Wetter to 32 parts distilled water. That is the mix that I used. It is interesting to note that according to the redline literature, less Water Wetter is actually better than more. The all black model is a bit over decaled from the factory. I do not mind a few well placed logos or brandings, but the bike has about five too many decals plus the warning sticker on the gas tank. I removed them carefully. I then did a little of my own decaling. Now people will know who it is that passes them.